Hamsters are inexpensive, easy-to-maintain and -- when they're awake -- entertaining pets. Aside from basic habitat needs, hamsters need toys to help keep them stimulated and active. 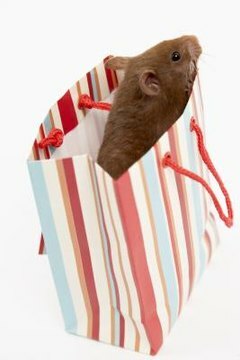 With a little creativity, you can create cheap toys for your hamster from common household items. Make toys out of empty cardboard tubes to help satisfy your hamster's natural instinct to tunnel. You can use empty toilet paper rolls or paper towel rolls to make an intricate maze of tunnels for your hamster to run through and climb over. By connecting a few of the rolls together, you can replicate the popular plastic tubes that are among the top-selling extraneous hamster supplies in many pet stores. Empty duct tape rolls or packaging tape rolls can serve as a "tire" swing for your hamster; make small holes on opposite sides and hang the tube from the top of the habitat lid so that it dangles close to the floor. Create a protective hideaway spot for your pocket pet by using a variety of cardboard boxes to design multiple chambers under which he can play and sleep. Using empty tissue or cardboard boxes, cut holes in the sides -- if none are already there -- and place the container upside down in your critter's habitat or play area. Authors of the Homemade Hamster Toys website recommend making a two-story house out of square tissue boxes by taping the boxes together with the holes pointing in different directions. Attach an empty toilet paper tube to the floor of the upper level, right at the entrance of the hole, so your hamster can access the level from the bottom of his cage. Provide your hamster with a homemade ladder that will allow him to access the top of his hideaway home or to top of a cardboard box by securing clean Popsicle sticks together in a ladder formation with non-toxic glue. You can also use the sticks to make a maze by gluing them together to form walls of different heights and angles. By using the sticks to make a few small boxes that you place around the cage you can offer your pet additional ways to play while getting some exercise. Turn a tin can, such as the kind that hold soup, canned vegetables and coffee, into a fun hamster toy by sanding down the edges of the opened rim that will serve as the entrance and exit of your toy. Fill with bedding and treats if you open only one end; you'll provide your pet with a new place to hide. Suspend the can in the air inside your hamster’s habitat using fishing wire if you decide to open it on both ends to make it a swing.